“”You need to ask yourself, why isn’t Rogers in the U.K., like Vodafone or France Telecom,” he said. So they’re bad because everyone else is bad, and they can get away with it! I’m just curious why you were so opposed to them wanting to take the conversation online — even after reading the Twitter exchange. You’re right that companies need to do a lot better when it comes to customer service online and right now I don’t think anyone has perfected that, but I still don’t understand why you think they should have been able to solve your problem in 140 characters or less. If you had called them, or allowed them to contact you, it may have alleviated some of your other problems (e.g. dealing with five different staff members). And your problem may have been solved in a more timely fashion. I also think your demand for something in exchange for your frustrations was kind of cheeky, especially if their systems were not at fault in this case. I don’t think they were trying to make you go away. They responded to you the evening in question, and pretty quickly, too, which for most companies is unheard of. I had an issue with a Boston Pizza location a few months back and sent an angry tweet about it. A few hours later, I heard from someone who apologized and invited me to follow her so she could send me her email address where she wanted me to send information detailing my experience and my address. So I did. A few weeks later, I received a $40 voucher for the restaurant, as well as an apology for my trouble in the mail. I was happy to email my concerns, as opposed to detailing them on Twitter, because it would have taken many 140 character tweets to explain what happened. That’s a poor use of the medium, if you ask me. When it comes to getting proper customer service, I feel we the customers often have to give a little to get something in return. We can’t demand and expect it will come. That’s just foolish. Thanks for taking the time to read and comment, much appreciated. Your Boston Pizza experience is a nice example. I’m not “so opposed” to dealing with issues offline, there’s absolutely a use for that. I wrote this post from the perspective, and my experience, of delivering customer care using social media. You can often achieve a better result when you solve problems in the open (as outlined in the post). This point is less of a concern for the customer and more of a lost opportunity on behalf of Rogers. If an organization establishes a twitter support team, they set an expectation that they will be able to deliver support using that medium. I don’t want to call them, because it uses my cell minutes, and there was no reason to DM as the information wasn’t confidential. If they wanted to email me, I’m fine with that, my contact details are on this blog – just a click away. Or I would have emailed them, if they asked. As for the compensation point, I’m paying for that service, and if I don’t get it, I should be compensated for the outage. Let’s say you paid for 30 days worth of internet service, and it only worked for 15 days, do you think you should be charged for the full month? And yes, it was their system that was at fault, so I think some form of compensation would be in order. My name is Chris and I’m part of the social media team at Rogers. First off, I must apologize for the trouble you went through. I’m very sorry for all the trouble. We’ve recently launched customer service via social media and it’s a learning process for us all. We take your feedback seriously and hope to use it to better improve the experience for all our customers interacting with us through social media. I hope that in the future, should you encounter any issues, we’ll be able to handle them in such a way that we’ll be able to put this behind us and work towards making you a “brand advocate” for Rogers – we believe we can because you’re clearly a passionate about the subject of customer service and social media! Isn’t your reply still doing exactly the same that David is complaining about? It seems you’re apologizing for the bad customer service (which caused frustration), but not for the initial issue or offering any sort of compensation. I got the same feeling, myself! In case I wasn’t clear, I’m very sorry for the problems that David went through with our Rogers OnDemand service, as well as the customer care experience online. David, I’ve asked that RogersRavi get in touch with you on Twitter to help make this right. I agree with you on a number of points. For one, I’m not sure why you would speak with five people in just two days; I can only imagine that the luck of schedules and breaks must’ve matched up just right so that you’d get different people. Two, asking the basic questions multiple times can definitely be frustrating. Three, insinuating you did something wrong, even if you did, was a mistake. You’re not the professional who does that stuff day after day, that’s what your service provider is for; they’ll need to make sure they are continually understanding of that. Having said the above, I agree with every point Sarah brought up. You seemed evasive about going to DM beyond providing sensitive information. Sure providers can do 99% publicly, but with direct messages being threaded it’s much easier to keep track of conversations than having public mentions mixed in with every other mention you get from other people. I honestly got the vibe that you intentionally kept it public with the intention of writing your article if it ended badly. On that note though, it’s unfortunate that one might so easily predict bad support that someone could know well enough to keep it public so they could make something out of it later. Then again maybe that wasn’t a thought until the very end of your conversation which might’ve been a turning point for me too; for them to bluntly suggest ‘there was no problem’, was a mistake. I really can’t agree with that in this case. Sure, you pay for digital. Yes, you paid for certain channels in your package which may also have On Demand. However, the reality is features such as On Demand, Online Streaming, etc are a free inclusion with the service you’re already paying for. Should you get free internet because your email was down for two days? Clearly not. It just feels more appropriate if the main and only point made is compensation for the experience versus ‘not getting service I paid for’. Now probably most people in a spot like yours reading that will automatically say “Well that’s why I got the service in the first place over a competitor”, but nobody can genuinely and honestly admit that to be the truth. The fact of the matter is you really didn’t care about the credit. A month credit might sound like little for you to ask for, but you have to look from the perspective of the provider too. You used the 15 day analogy, yet you suggested a 30 credit in your article for a ‘2 day outage’ of a free ancillary feature of your paid services. ISPs might be used to customers having multiple service calls in a single week for a service and generously giving double that with two weeks. You also suggested a free PPV; that’s far different than a month of credit. That stands out to me. It again reminds me that credit had nothing to do with it, despite you mentioning it a few times in your article. In frustration those points will come up by most people, including myself, but I think you and everyone else can probably agree that your real issue was how you felt you were treated. You felt like you weren’t a priority. You felt like you were just trying to be brushed aside to private DM. Each resistance to going to DM was almost your way of wanting to be proven wrong, unfortunately you weren’t. It took too long, the questions got repetitive, and finally the reason for no credit was that there wasn’t really a problem. Had that conversation been private they might have gone into more length. One of the difficulties with replying 99% in public is the constant fear of companies turning a request down just to have it twisted and manipulated in public by the recipient. You suggested here that had they asked for you email that you would’ve provided it and gone that route, but I don’t think that would be the case. Sure companies should use twitter in the way that their customers are using it, but customers also have to realize that every type of issue isn’t going to be most efficiently addressed via public contact, DM, or Twitter at all. At the end of the day, it’s not about apologizing, but empathizing followed by real results. I’ve had experiences with providers of mine where the issue took a week to resolve. The difference though was they contacted me first. Instead of me waiting 30-60min in between each reply and then the next morning having to be the first one to reach out again, it was the reverse; I was contacted first. I was followed up with. Even when they didn’t have new information, they reached out just to say “Hey, we still don’t have anything new for you but we wanted to reassure you that you’re still on our radar and it’s a top priority. We’ll continue to keep you updated.” Support like that is what you could’ve used. Your issue could’ve lasted 10 times longer and you would’ve been fine as long as you felt like there was importance put toward your concern. I think it’s great that you wrote your article. It brings about a lot of points from both ends of the spectrum, both the customer’s side, and the providers. Nicely done! Thank you for taking the time to write such a lengthy response, it is appreciated. You bring up several valid points, but I think you hit the nail on the head when you said “your real issue was how you felt you were treated”. That’s the real issue, the actual service outage wasn’t the point of the post at all – nobody really cares if I can watch OnDemand, or not. It was more the customer service that was unacceptable, but it all things have to be considered for each customer service experience – the problem, and the reaction. Providing a token of compensation is a best practice for customer service providers. My examples were just that – examples. It really could have been anything; it’s the gesture that matters. We do pay for OnDemand. Just because it’s not itemized on the bill, doesn’t meant that we don’t pay for it. It’s a part of the package, and if it is not delivered, I’m not getting the package I paid for. You are correct in thinking that I didn’t want to go to DM. Beyond it being in the interest of both the company and the consumer to solve the issue openly, I get hundreds of spam DMs a day and they are really hard to sift through. And if Rogers is on Twitter for customer service, customers should expect to have their issues addressed, not taken offline to be dealt with later (or not at all). I do take exception to your questioning my motives and the suggestion that I wouldn’t have switched to email if asked. Implying that I am not being honest or wanted to get poor customer service because I wanted to write a blog post is inappropriate. I can assure you I just wanted to watch the Leafs game. The ideal resolution would have been for me to tweet, Rogers to troubleshoot, and I was able to watch that game. The customer service experience you describe at the end of your comment would have been acceptable. I like that the company you were dealing with continued to follow-up with you to let you know they are still on it. Again, I really appreciate the time you took to respond to my post. Many thanks. I’ve had a wide range of experience with Rogers. I’ve had some really phenomenal reps – friendly, knowledgeable, and willing to give discounts. They have always apologized. And when I did go through Twitter once (after sending 3 detailed letters and receiving completely unsatisfactory responses), my concerns were “elevated” to the business office where they were promptly dealt with. b)have my problem resolved by one person. If that person doesn’t have the information, they should do the leg work necessary to get a resolution, and call me back when it has been solved. If a transfer is absolutely necessary, the first rep should fill the next level in on the situation. Customers shouldn’t have to repeat a problem to multiple employees. Everyone makes mistakes. It’s how you deal with them that counts. You are absolutely correct, every company has good and bad reps. I used to have all of my services with Rogers, but I’m slowly moving my accounts to other providers because of the service. I think your solutions are great “rules-of-thumb” for ANY customer service provider. If they all approach their jobs using your tips, they would have a lot more happy customers! I agree- one of the worst customer service in Canada. I’ve had many negative experiences both on Twitter and elsewhere and they are never helpful. I still have issues left unresolved, but I have given up. Ouch. It’s never good when a company “defeats” its customers. We shouldn’t have to live with unresolved issues. My name is Keith and I’m the vice president of social media at Rogers. I want you to know that we are taking your experience very seriously and working to get to the bottom of what went wrong. We clearly made some mistakes in handling your concerns. We’re looking into which were isolated errors and which were systemic process errors that we need to address. Clearly, there were times when you waited too long for a response from us. We had too many different accounts engaging with you. And while our policy is to take most conversations offline in order to protect customer privacy, this may have been an issue we could have resolved for you in public without needing to validate your account. You said nobody asked you what you finally did to solve the problem. On our end, we assumed (perhaps incorrectly?) that it was after you updated your address that you were able to access content again. But if this is incorrect, we’d love to better understand what it took to get things working for you again. Ravi will be reaching out to you to offer you some movie passes for Rogers on Demand as a token of our apology. Despite what you went through, I believe the majority of customers who reach out to us for assistance do receive a great customer experience and I’m very sorry this was not the case for you. Thanks for getting in touch. Yes, Ravi got in contact late this morning and we worked something out. If you are interested in the solution I found, I would be happy to share. Please feel free to send an email to davidhallsocialmedia@gmail.com and I will fill you in. It was really quite simple after some trial-and-error. It’s great to hear that you’re taking an in-depth look at what when wrong here. I invite you to get in touch with me and share those findings so I can do a follow-up post on Rogers’ social media gone right. Perhaps an interview would be appropriate to properly articulate what you looked at, what you found, and the lessons learned. You will probably notice that the majority of the posts on my blog are neutral, with some being quite positive. This post was documenting a case of social media gone horribly wrong and, as a result, doesn’t paint Rogers in the most flattering light. I hope to hear from you with the findings of your investigation and, if you are up for that interview, do a more positive follow-up post. Thanks for reaching out. I think we are back on the right track now. The solution to the problem was pretty simple, but not overly intuitive. Here’s what I did. Updated postal code (i had to do this several times over the couple days, because it wasn’t saving my information). Then I reconnected all of my accounts using the first option (through my modem at home). Save changes and I was done. That was it, but it took me a little while to figure it out. Hope that can be helpful to your team. Update: I was offered 2 free ondemand movies rentals for my troubles. When I received my bill this month, I was charged FULL PRICE….I kind of figured that would happen. Now I have to hassle Rogers, again, to be billed properly…. Update 2: @RogersRavi reached out and addressed this new billing issue. Problem solved pretty quickly. Good work! C’mon David, why not share your solution on Twitter…after all life is all about Customer Service on Social Media, isn’t it? I mean, you basically blasted Rogers for wanting to follow-up offline. Don’t you owe it to Rogers to put your money where your mouth is and be totally transparent on Twitter? @MarkOrlan – That’s a good point. I guess I could have given told them my solution to my problem right off the bat to help them out. But at that point, after receiving very unsatisfactory customer service, I wasn’t really in the mood to give them a hand. If they had a history of providing me with great customer service, I would have definitely jumped at the chance to help a brand that I love. IMPORTANT NOTE: Mark Orlan provides Rogers Telecommunications with advice and strategy on customer service. 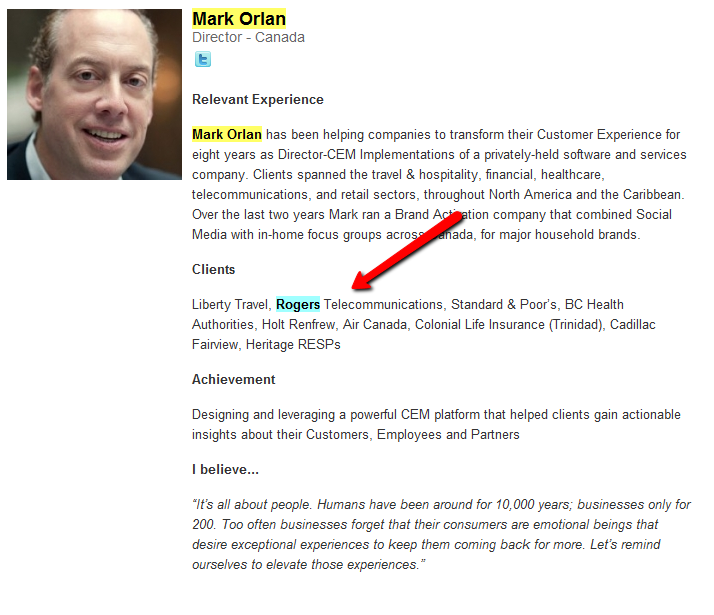 Although Rogers is one of Mark’s clients, he has failed to disclose that detail. When we share on Social, we’re sharing for the community at large…we’re sharing so others can learn. Otherwise, take it off line and deal with the problem in a more direct and efficient way than tweeting 140 characters at a time. Makes good sense to me, but perhaps I’m in the minority here. David, I’m actually referring to your comment just above, at noon today. Surely by now you’re in a much better “mood” to give Rogers a hand, especially if you’re offering an olive branch to Keith? I’d be interested in your solution, because the same thing could happen to me, and as a Rogers customer it might be helpful. After all isn’t that truly the value of Social? In your point 9 above, it sounds like that’s what you’re getting at when you talk about trying to keep the conversation on line in Twitter. Think of how your solution might help others. Mark – Thanks for the additional comments. The conclusions you drew today about social media are bang-on – it’s about sharing and learning. Your comments got me thinking about a number of questions that I may explore in another post. For example: Who bares the responsibility share this information? Is it mine as the customer? Is it up to Rogers as the provider? Is it up to me because I have a Twitter account? Some of your comments seem to be placing the onus on me the consumer, but I may have misinterpreted what you meant. Then some other questions crossed my mind from the social media perspective: “As a social media curator, would sharing this information be too off topic? Should I have even used my twitter account in the first place as my followers probably don’t care about my ondemand service? Is it the responsibility of the social community as a whole to troubleshoot problems when the service provider can’t (or won’t) step up with a solution? Does it make a difference whether the company is loved or hated by Canadians? This (potential) collaboration would be a great demonstration the true power of social media. ….Yes, my mood is improving towards rogers, Keith and I have connected and I’m looking forward to helping them out. You have to understand that this is not a one-time thing, Rogers doesn’t have a great customer service track-record in my house. You may see another tweet about the solution in the future. But in the meantime, here’s how you solve the issue in case it happens to you. Login, make sure your postal code is updated, now disconnect all the accounts you have registered, logout, log back in, reconnect all of you accounts using the first option they provide, save changes, and you should be good to go. Sounds like you’ve got some good thoughts to ponder. David, you don’t have to convince me that Rogers doesn’t have a great track record with Customer Service…I’ve been long-time customer myself. But their issues are symptoms of a large Telco (or a large anything, for that matter) that has gone through major acquisition over many, many years; they have inherited disparate information systems with multiple views of their customers; they are a very product-centric company that does not provide a consistent customer experience. They’re a big ship. And it’s going to take a few more years to navigate their turns. However, they are making progress. They are trying. And it may be that Social Media is forcing their hand a bit, because they have to be more transparent. But whatever the case, I’ve seen progress in the past few years – sure, you still get “Peter” on the phone the odd time, who doesn’t do as great a job as “Sally” did when she helped you a few months ago and gave you all those freebies and set the bar high. That’s a common symptom of a company that is not customer-centric. They may say they are, and have all the “customer-first” posters hanging in their call centres to give the impression they are, but it’s clear that they still have a ways to go in terms of executing a consistent Customer Experience (customer-centric, customer-first, whatever you want to call it) strategy. Social Customer Service is a single touchpoint in a convoluted Customer journey. While I appreciate your offer, debating a few questions related to Customer Service and Social Media is probably not going to be much help to anyone. While Social Media is an amplifier for poor service, we don’t even know how important it is for Rogers customers as a total population. If only 1 or 2% of their customers interacts with their service channel through Social (it’s probably somewhere in that neighbourhood for most companies), how critical is this channel for them….really? As practitioners in the Social space, our lens is too often a Social one, and we tend to see everything through “Social glasses”, if you will. The fact is, Social Customer Service is such a new space to play in for most companies. Everyone’s still learning and jockeying for position. There are no right answers yet, or best practices in such an immature space. So to speak as if we’re experts would be rather naive of us. By the way, thanks for sharing your solution. Hopefully it gets cross-posted in one of Rogers’ user forums for others to learn from. Good luck and keep the interesting posts coming! Why wouldn’t you come clean and disclose your professional relationship with Rogers? You may not think it’s important, but it really is. If you want to participate in the social conversation, you need to treat the participants with respect. Not telling us that you have a professional, customer service-focused, relationship with Rogers was a mistake. C’mom Mark. Let’s be open, let’s be honest, let’s be fair. When we share on social, we have the responsibility to be transparent. If you work, or have worked, for a company you are defending, you should be disclosing that. This IS a customer service best practice. All of the Rogers reps did it, so when did you leave that critical detail out? You are welcome to continue commenting on my blog, but if it is in relation to Rogers, please be sure to disclose your relationship – it’s only fair. I was initially very disappointed in your approach to this situation, but I am quite happy you’re mood is improving towards Rogers. Having formerly been an employee for close to 5 years, I am absolutly not surprised that Keith responded and reached out to you. I worked in Cable Internet tech support for nearly 5 years until October. I provided support for Cable Internet, Portable Internet, Hotspot, and Rogers On-Demand Online (but not regular On-Demand which is supported by Cable Repair). Unlike many agents, I also provided backup support to the live chat agents for these services. I promise you, the emphasis on providing great customer experiences is huge, and very real. However it is (in my opinion, although understandably) balanced by business needs to keep costs down. During my time there I was one of the top 5 agents nationally when it came to call quality ratings (60% of the scores at the time were actually from the customers), however I did not consistently balance this with the business needs to keep average call times below a certain length, keyword average, not individual calls, there are simply some calls that you can’t avoid the time it takes. Although I will admit this is not the perception because individual agents don’t follow this, or don’t care so they don’t put enough effort in, and those that do,typically move up (double-edged sword there), and other reasons. I consider my self very tech-savvy, I studied computer engineering at Seneca, grew up with computers from the time I was 2 years old with DOS, I’ve had a cell phone for 13 years, of the 6 cell phones I’ve owned, 5 have been smartphones, all Nokia (current is the N9 running a variant of Linux, sort of similar to Android). One thing I’ve never understood is the point of Twitter, especially for tech support. But that is just a disclaimer. I have seen your issue before, and solved it before. It’s not an unkown issue for the phone, email, and chat agents. As far as I am aware, the Social Media department is really not a tech support group, and not intended as such, they are probably talking to tech support agents when they don’t know what to do. I’m just guessing because I wasn’t even aware that support was provided via Twitter (we would NEVER have even suggested it to a customer in my time there). I, and pretty much every agent I worked with in that call centre, would have been able to solve your issue in a matter of minutes, not days. It would have required account athentication as in order to see the issue and diagnose it, I would have have to pull up both your billing and services account, and your RODO account. This should explain why they wanted to take you offline, to provide you with a much better and quicker experience. If you wanted it documented for public use, although I am not sure why that is needed when tech support is free, it’s not like an application or OS where there’s a need for an online knowledge base, then the community forums would have been a better choice I think. Rogers provides support in the following ways, telephone, live chat, email, community forums, Twitter, rogers.com, rogershelp.com (which for internet links to Yahoo maintained pages for the Yahoo provided services like email). If it’s not already being provided, it’s probably in the works to provide phone support with remote access the way live chat does. The core reasons you ended up speaking with 5 different agents and that it took multiple days is, in my opinion, directly related to the use of Twitter. It doesn’t lend it self to real time, like phone and chat, and thus takes longer. The fact it takes longer leads to agent’s shifts ending and a new one taking over, and then you run into agents having days off. I realize there are benefits, in theory, to providing support via social media (I think FB would have been much better than Twitter though). In that light, I do agree that despite the limitations of the support medium you chose your experience could have been much better, and Rogers, and other companies, can be greatly improved upon. They should have explained more about why they suggested taking it offline, they should have explained why you had a new agent, and that agent should have reviewed your profile and the correspondence history (and with private messages, hopefully they had your account # and RODO username to check your accounts in their system). It would also have been nice if they were to take it offline to arrange to have a tech support agent call you at an agreed upon time, not have you call in, and ensure that agent was familiar with you and your issue. Especially when you said you wanted to watch the Leaf game, it should have been said “I’d be happy to help, and will do so, however if you want the fastest resolution, chat or phone support will be able to ensure you are able to watch the game, as I can not guarantee this can be resolved in a few minute via Twitter”. Maybe this comes from my lack of knowledge and experience with Twitter, but it seems to match your experience and what I know of supporting the service. I know it can be frustrating to deal with companies, even Rogers, I’ve experienced it, before I worked there, while I worked there, and now after working there. It’s not easy, but I always try to look at the isue from both sides. How do you react when someone is yelling at you, or not listening, what’s human nature. Many agents care a lot when they are new, but the more they are treated badly by customers (yes it happens, as does customers being treated badly by agents, it’s a two way street) the more they stop caring. Sometimes customers have unrealistic expectations (I had a Bell customer intentionally call Rogers to support their DSL service from Bell because Rogers agents are all in Canada, or some other reason, that’s an extreme example, or they think Rogers is responsible for Facebook (or MSN Messenger in the past, or PlayStation Network not working, or they want a technician to come to their home to fix their email, and they want the technician same day and it’s already 5:00pm). An agent has to do a lot to help a customer understand things, and when dealing with technology, it goes over the majority of customers heads, especially if we’re not careful. Imaging what it’s like providing phone support and not being able to see the customer’s computer screen, modem, etc. Imagine then live chat, you can’t even speak to the customer verbally (sometimes typing is an advantage, but it’s one of the things we try to avoid having a customer do while on the phone, we say go to http://www.speedtest.net and they google it instead of putting it in the address bar), then imagin constant delay in response via email, twitter, or forum, and your shift ending before resolving the issue because you’re waiting for a response. Ok so the agent on email, twitter, forum, is also dealing with 10 other customers at the same time (sometimes more via email), it’s tough. Bottom line, it can and should be a lot better, but there are better support options than Twitter, ones that would have had your issue resolved and allowed you to watch the Leaf game (too bad they’re in a slump right now). Also in case you’re wondering why I left the company, I left to spend nearly 6 months out of the country, 5 of which are being spent here in Israel (as I am sure you would have noticed via Google Analytics and my IP address). I really appreciate your view from “inside the company”, thanks for sharing. I do think Twitter is a good way to provide customer service. I’ve experienced it, and delivered it, before. Perhaps, in this case, Rogers established an expectation that they just couldn’t live up to. In my view, establishing a Twitter account called @RogersHelps, would lead a user to believe they could get help from Rogers using Twitter. I tried to do so, with little luck. This may be because, as you said, “The social media department is really not a tech support group”. If that is the case, that would be the problem. These agents need to be trained to deliver that level of service (I also suggested that in an email to Rogers). Thanks again for the details, and the “speed of service” list you provided, that may come in handy in the future. I’m just curious, how did you find my blog? The majority of my readers are in North America and Europe. David, the beauty of the web, especially if you’ve built up a history, is that it’s open to the world. Sorry if you thought I was trying to fool you. I think that would be pretty naive of me. As for my short bio on the Strativity website, that lists a few key clients I have worked with over the course of my career, in the area of customer experience, voice of the customer, and research-related engagements. Rogers is a client I worked with while at a previous company, a few years ago. They did not hire me or my current company to help them with a customer service strategy. They are not a current client. My only bias in posting here is that I am a customer of Rogers and have been for over 20 years. I’ve had many experiences with them on the wireless side, the cable side, and the internet side, both positive and negative. But I’ve seen some real improvements in service over the past few years, and I just wanted to acknowledge it. They’re definitely moving in the right direction. I had some opinions on this post of yours and I chose to voice them here. I took a side, openly. No one was trying to fool anyone. Just as you took a stance with Rogers, I took a stance with your post. There’s no disrespect here. We’re using this medium to share opinions that hopefully spur further conversation. Again, good luck as you forge ahead! You bet Mark. It’s exactly those conversations that motivated me to launch the blog in the first place. I love hearing opposing opinions, as they often provide learning moments for both sides – I think we are on the same page with that one. I do expect this transparency in my comment thread, and it has always been there. Perhaps I will now consider posting a “Comment Guidelines” document for this blog – another learning moment. I encourage you to continue reading, and sharing your opinions, to help contribute to the conversation. David, I completely understand your frustration as a customer andf if Rogers offers customer service trough Twitter, you can assume it should work. But…. When reading the Tweets I got a feeling both sides did not behave well. To me, this is an example where a phone call would be much more efficient. I’m using SM frequently but I would never use it for time critical interaction to solve a problem. David, be honest, would you insist to stay on Twitter if you would not be an SM blogger? I doubt. I always ask myself why SM advisors love to make such stories public. Same like all the agencies fueling up “shitstorms” by making everybody aware that one is going on. I’m advising companies in SM, too, but I would never blame a potential customer in public, especially not, if I’m trying to sell them my services. To answer your question, yes, I would prefer to have my customer service issues addressed using Twitter if I wasn’t a social media blogger. I began using it to interact with brands long before I launched my blog. I’ve had some great customer service experiences, too. Using the traditional telephone is not the most efficient method for me. At the end of the day, it’s not about a blog post, or OnDemand, or twitter, it’s about the poor customer service I received. I would have preferred to have the problem solved right away, and not have to go though the whole ordeal. If that was the case, I would have watched the hockey game, and not bothered with a blog post. Fair enough. Nevertheless, our view on going offline (and not staying on Twitter) simply shows the differences in how various cultures are using the social media channels. Europe did not follow the US, behaviours are still very different. That’s what we have to learn to accept, especially when going global with marketing and customer support. 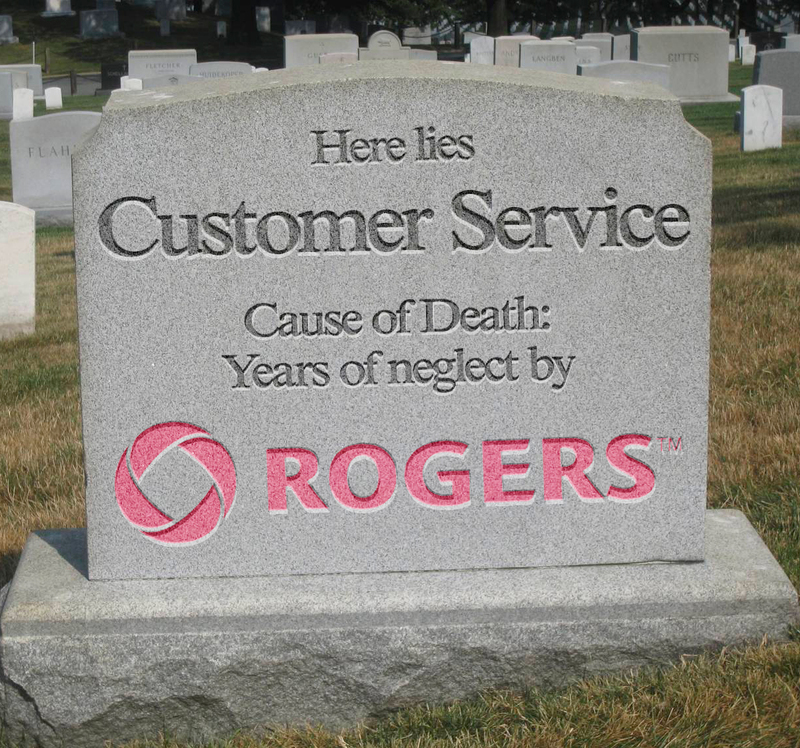 I stumbled across this after reading of another issue that a Rogers customers has had with the company and reflecting on my own experiences with Rogers, as well as experiences of friends and family, and although it’s a few months later, it still seems relevant, on a number of fronts, including customer service and customer expectations. Customer service problems such as this are not unique to Rogers. Very similar situations happen with Bell Canada. Unfortunately, neither of these companies are designed in such a way to manage front-line and customer facing issues easily, for a variety of reasons, including inculcating an ethic of customer service amongst staff. For that to happen you have to have an organization that cares about the outcome, not time spent on the phone. I’d say that’s out of scope for this discussion, but it’s all related and connected. At the same time, customer expectations are unrealistic. Managing them, and managing them efficiently, effectively and ideally without escalating it into an issue is something all companies aim to do. I have to say, I’m surprised that anyone would want to do this over Twitter. When a problem arises, I think Twitter’s limitation as a tool for effective and meaningful communication tool get in the way. Sometimes, technical issues are related to customer inexperience or oversight. But when that’s not the case, Rogers’ track record of owning up and rectifying or reimbursing isn’t great either. But expectation management is important here, too. What we lose sight of is that this is still new technology: we expect it all to be as reliable as starting a car, or picking up a landline telephone and hearing a dialtone, but a reality check is in order. So much can go wrong with the service delivery end and the various platforms. Customers don’t react well when the service isn’t accessible. A smart company would figure out a way to let customers know pronto when there’s an issue with the lines, or the wireless, or a platform. But nope. You’d think that managing account or service downtimes is a huge customer service issue for service providers, so much so that it should be considered a strategic advantage. Strategic customer service should be seamless and consistent across ALL points of contact with the customer, whether the phone, in person, in mail, or online: email or twitter. Perhaps that’s why some companies are using the term social business as opposed to social media. Maybe it’s unrealistic to expect a problem to be resolved over the twittersphere. But if that’s an expectation of a growing number of twitter users, and if it’s doable, why not get there first? At least with most frequent issues. Rogers doesn’t have an ethic of customer service. It does not view customer service as core business. And let’s be honest, the customer is often not right. Some customers aren’t even nice or honest, and some aren’t even worth having as customers. As one commenter said, the company might be making improvements, but those improvements have no currency if there’s no evidence of it, and the place where customers see improvements is in their direct interactions with the company. It’s possible that there were unrealistic expectations happening here, and some less than ideal communication between the parties that took this situation to a place it needn’t have gone, but it doesn’t erase the reality that Rogers and its customer service is a textbook and jargon-filled example of everything not to do. Hopefully, in time, we’ll have more choice in terms of who we get to use to provide service, more consistent service across the country by a handful of great providers and maybe, just maybe some of them will have not only great product, but great customer service as well. Rogers seem to have perfected customer abuse and turned it into an artform. To make this a short story, we have wasted four days and risked numerous aneurisms attempting to resolve an installation problem that ROGERS admit they created in the first place! Even my wonderful wife, who has the patience of Job, finally blew a gasket after telling me to calm down and let her deal with the problem in a non postal manner. Even attempting to cancel the service (they want to charge an early cancellation fee for a service which has never worked…so what exactly are they cancelling?) requires you to spend an hour on hold AT THE ROGERS STORE…to no avail. I am passed pissed off and am seriously considering finding others who have been similarly abused, in order to initiate a class action suit against rogers. The only way to effect change with a large company, is to cost them large amounts of money, so maybe if they are forced to return every incorrect over charge, early cancellation fee and unearned tech service charge, plus interest and legal fees…..they would get the point. With any luck…. (and hopefully an understanding judge that is also a rogers customer), they could be forced to payout literally millions. Their entire customer disservice sham is purposely design to have you give up (after holding for an hour or so before being transferred to a rep that seems to understand and pretends to resolve your problem….only to be returned to square one) and live with THEIR errors. So, if you are interested in participating in a potential lawsuit against Rogers, contact me via ihaterogers@ymail.com and let’s see if we can’t give them a taste of their own proctology exam. Thanks for the comment! That’s a great link you provided about how to cancel a contract. Some of its practices are certainly unlawful. We should rise public aware and should let government know about this very serious situation. Credit bureau should also be alerted. A lot of people are angry because they were cheated and bullied. Please check on this website： http://www.amplicate.com These miserable Canadians are finding an outlet for their emotion in an American website. 1. The company makes up fake contracts, and surprises you with high bills. 2. Your rightful requests for cancellation would be purposely ignored. 3. Sent you to credit collection by mistakes again and again. (You should keep receipts back to three years). 4. Translate their mistakes into your wrong doing. 5. Make you feel like low life. You’re all honestly better off just never thinking about Rogers again. I did this three years ago and my life has been so much more peaceful and less full of rage. Leaving Rogers was such a good decision.